Okay, actually this is a list of the top nine toughest ways to earn $300, and the top one easiest way. 10) Work one hour as an Alaskan king crab fisherman. Sure it’s only an hour of work, but the only thing more dangerous than working those boats is going to see the new Notorious B.I.G. movie. 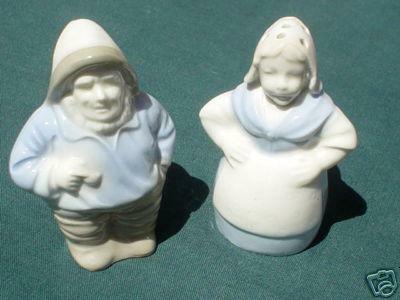 9) Find and then sell 78 vintage, German Fisherman and Wife salt and pepper shakers on eBay. 8) Deliver 6,000 flyers door-to-door. Or, if you’re me as a 13 year old, sign up to deliver flyers, but then actually get stuck with delivering 6,000 free samples of a new maxi-pad. 7) Make three, um, deposits to your local sperm bank (men only, I’m pretty sure). 6) Find and return 6,005 empty beer cans. That’s 6,000 to earn the $300, plus 5 extra to earn the quarter you’ll need to get a shopping cart to hold them all. 5) Sell 100 boxes of Girl Guide cookies. I’ll leave it up to you how to secure 100 free boxes of Girl Guide cookies. 4) Submit yourself for a one day medical experiment at a local university or medical research firm. 3) Send me $50 and a self-addressed stamped envelope, and I’ll send you instructions for how to make $300 easy, from the comfort of your own home! This is not a scam!!! 2) Write a resume and cover letter, submit them to dozens of companies, finally get a first interview, then a second interview, then start your new job then finally work for 10 or 20 hours doing something you hate. 1) Make a deposit right here at Silver Oak and we’ll match it, up to $300. Check out our huge deposit bonuses here.